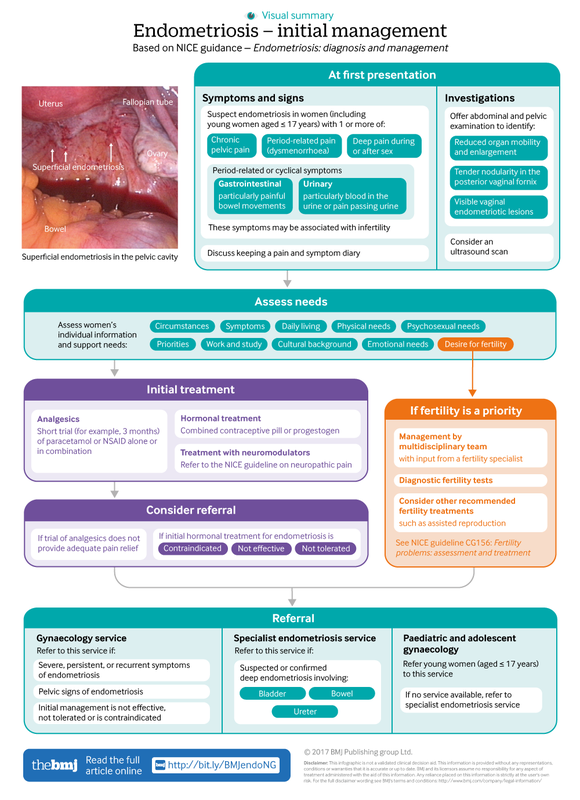 Click here for a visual summary of newly updated NICE guidance for endometriosis diagnosis and management. Endometriosis is one of the most common gynaecological disorders, affecting an estimated 10% of women in the reproductive age group (usually 15-49 years old), and in the UK it is the second most common gynaecological condition (after fibroids).1 Endometriosis is hormone mediated and is associated with menstruation. The precise cause is not known, but it is widely accepted that endometrial cells deposited in the pelvis by retrograde menstruation are capable of implantation and development. It is a long term condition causing pelvic pain, painful periods, and subfertility. Endometriosis presents a diagnostic and clinical challenge, with many women left undiagnosed, often for many years. Small observational studies have reported delays of 4-10 years in diagnosis,23 which can result in decreased quality of life4 and disease progression.5 The diagnostic delay is not limited to adults; endometriosis is also often missed in adolescent girls,6 and this guideline aims to improve care by highlighting this age group in some recommendations.